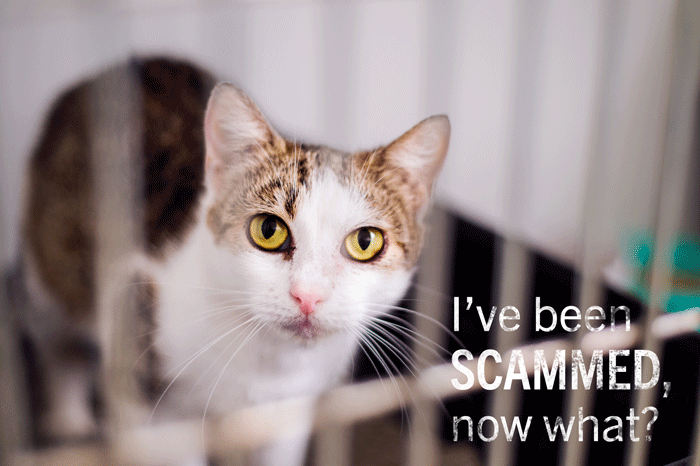 Pet scams can happen to anyone. Learn how to spot a scam or you could be a victim! Looking for a pet online? Don't get scammed! 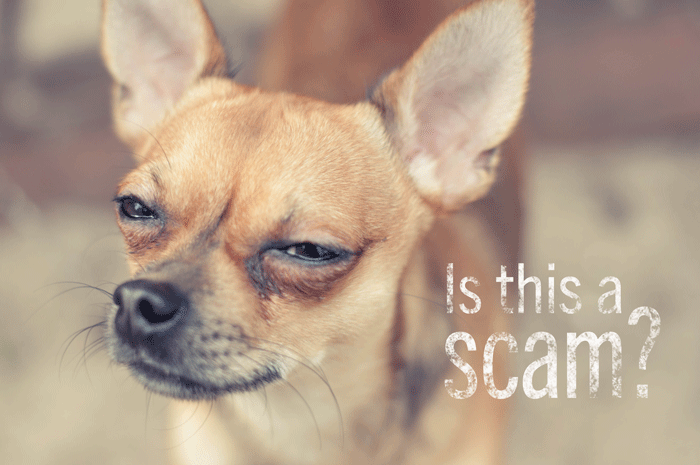 Pet scam criminals often use free websites, Craig’s List, local newspapers, or Facebook to advertise pets that do not exist. Expensive animals, like Bulldogs or toy breeds, are offered at very low prices. Animals are offered up for adoption at no cost—all you have to do is pay for the shipping. If you see an ad like this, chances are it is a scam. These scammers are criminals. Their goal is to take your money. They will lie, they will tell you sob stories, they will send you pictures of adorable animals, they will assure you of their faith and religion - anything to get your money! They use the names of legitimate pet shippers; they pirate websites; they illegally use logos of other companies. If you see an offer that is too good to be true, it probably is. It probably is a scam! Say they are giving the animal up because of a family hardship, relocation, death of the person who owned the pets, the climate is not good, etc. Use a free Gmail, Yahoo, or similar address. 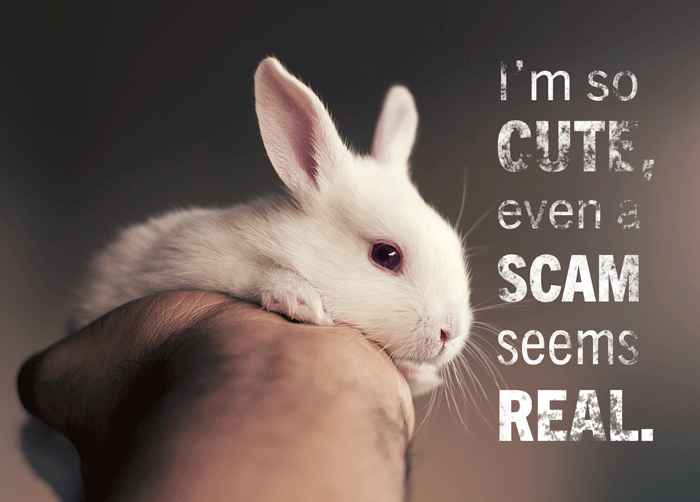 Call the pets their “babies” and insist that they only want a loving, forever home. They may send you a list of questions about how you will take care of the pet, if you’ve had a pet before, etc. Offer the pet in one location—close to you—and then tell you that because of some situation, the animals or they are somewhere else where you cannot see them or pick them up. Want payment by Western Union, MoneyGram, or a similar service. They might tell you to lie to the Western Union agent, saying you are sending the money to a family member rather than buying something. Use different company names or variations of the same company name in the text of their message. Tell you to lie to the Western Union agent—saying that you are sending the money to family or for personal reasons, rather than making a purchase. Tell you that their books are being audited; the head office is moving, or something similar. Tell you to send the payment to a different office - usually, but not always, in Cameroon. Once you have sent payment for the shipping, there will be a problem: the pet needs a different kind a crate; needs a health inspection; needs insurance; etc., for an additional fee. If you don’t pay right away, they add charges for additional feeding, threaten you with legal charges for animal abandonment, etc. Use the name and website address of a legitimate pet shipper in their email. Have poor spelling and grammar in their email. First: Stop contact with the scammer; simply ignore their email or telephone calls or block them. Do an online search (Bing, Google, AOL, etc.) for the email address of the advertiser. Scammers often place ads on several free sites or locations. If you find multiple ads, it is most likely a scam. Do an online search on part of the text used in the email you receive from the shipper. Especially search for their introduction or information about the company. If they claim to be a member of IPATA, you can easily check on that by using our “Find a Pet Shipper” page. On occasion, there are new members that are not listed on the IPATA online directory. If you have questions, the only way to confirm a companies membership in IPATA is to contact IPATA directly. I've been scammed, now what can I do? Stop contact with the scammer; simply ignore their email or telephone calls or block them. File a report with your local law enforcement and with your local FBI or equivalent office. File a report with the Internet Crime Complaint Center: www.ic3.gov. This agency is a collaborative effort among several law enforcement agencies who use criminal email addresses and websites to track these, and hopefully, apprehend these criminals. Contact the publication or site where you saw the ad. Let them know that this advertiser is a scammer, give them the email address of the scammer, and ask them to remove the ad(s) and to blacklist this person. Talk with a manager at the MoneyGram or Western Union office you used to send the money. Be sure to take a copy of the emails with all the telephone numbers, names, email addresses, etc. of the scammers. Do an online search for the advertiser’s email address. If you find the ad on other publications, let the site know about your experience so they can remove the ad or blacklist the advertiser.
. They will be added to the IPATA Scam Alert List.